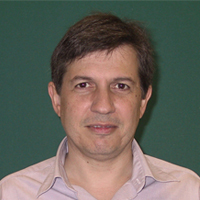 Dr. Siopsis is a theoretical high energy physicist with over 100 publications. In recent years, his research has focused on quantum gravity and related issues (holography, entanglement, the information loss paradox), and applications to condensed matter physics. He has trained several PhD students who have embarked on promising careers, and introduced undergraduates as well as high school students to research in quantum physics and fundamental interactions. Recently, he has started working on quantum computing and quantum information processing in collaboration with members of the Quantum Information Science group at ORNL. He has also developed and taught a graduate level course on Quantum Computation and Quantum Information.